KANSAS CITY, Mo. 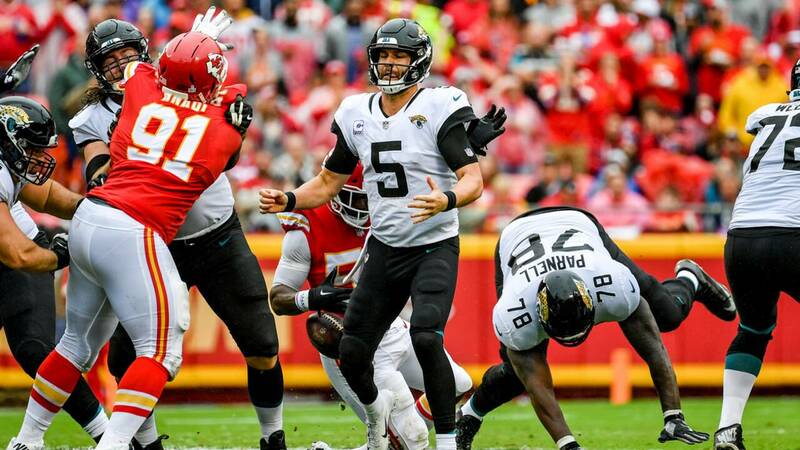 - The Chiefs' beleaguered bunch forced Jacksonville quarterback Blake Bortles into five turnovers, including a pick-6 by defensive tackle Chris Jones, and Kansas City merely had to supplement with the NFL's highest-scoring offense in a 30-14 romp over the Jaguars on Sunday. Patrick Mahomes threw for 313 yards and ran for a touchdown, though he also threw his first two picks of the season, and Kareem Hunt added 87 yards and a touchdown on the ground as the Chiefs (5-0) marched all over the league's top-ranked defense at soggy Arrowhead Stadium. Tyreek Hill, who was frequently matched up with the Jaguars' Jalen Ramsey in an entertaining one-on-one affair, had four catches for 61 yards in a game that grew testy on both sides. Jones was ejected in the second half after he dropped an elbow on a Jaguars lineman while both were on the ground following a point-after attempt. Pass rusher Dee Ford joined him in the locker room later in the half when he was whistled for his second unsportsmanlike conduct penalty. Nobody had a worse day than Bortles, though. He was 33 of 61 for 430 yards with a touchdown and four interceptions , and also ran for a TD - though most of his yardage came in garbage time. Bortles also was strip-sacked in the first half as early rains soaked the field. By that point, the Chiefs were on their way to a 20-0 halftime lead. Mahomes led them 73 yards on their first possession, finishing the drive himself with a short scramble for a touchdown. Then he led the league's high-powered offense 82 yards for a field goal a few minutes later, leaving Jacksonville's vaunted D second-guessing itself. Jacksonville (3-2) drove inside the Kansas City 5 early in the second quarter, but an incomplete fade on third down and another incompletion on fourth turned the ball over. Bortles was strip-sacked on the first play of their next possession, and he threw the pick-6 to Jones on the first play of the next. Jacksonville's calamitous half ended when Bortles, trying to force a pass into the end zone, instead bounced it off his offensive lineman's helmet and right to Steven Nelson for another interception. In Bortles' defense, his offensive line didn't give him a whole lot of time. He was sacked five times and the Chiefs had another 11 hurries, spending most of the game right in his face. The Chiefs' first TD was the first allowed by Jacksonville on a team's opening possession. ... The Jaguars have not started 2-0 on the road since the 2007 season. ... Jaguars RB T.J. Yeldon had 53 yards rushing. ... Chiefs TE Travis Kelce had five catches for 100 yards. WR Sammy Watkins had six for 78. Jaguars: RB Corey Grant (foot) and LT Josh Wells (groin) left in the first half and Tashaun Gipson (hamstring) - who picked off Mahomes - left early in the second. Ramsey left on the opening series after taking a knee to the helmet, but returned to play the rest of the game. Chiefs: OLBs Justin Houston (hamstring) and Tanoh Kpassagnon (ankle) and FSs Armani Watts (groin) and Eric Murray (lower leg) left the game in the first half. RG Laurent Duvernay-Tardif left in the final minutes with a left ankle injury. Jaguars visit the Cowboys next Sunday.